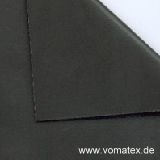 VOMATEX supplies different kinds of transport belts e.g. for fusing machines, drying machines and shrinking machines. The belts are custom made according to the dimensions you submit to us. Almost every type of belt can be supplied. Endless woven belts offer a unique tearing resistance and have no joint and thus no seam. 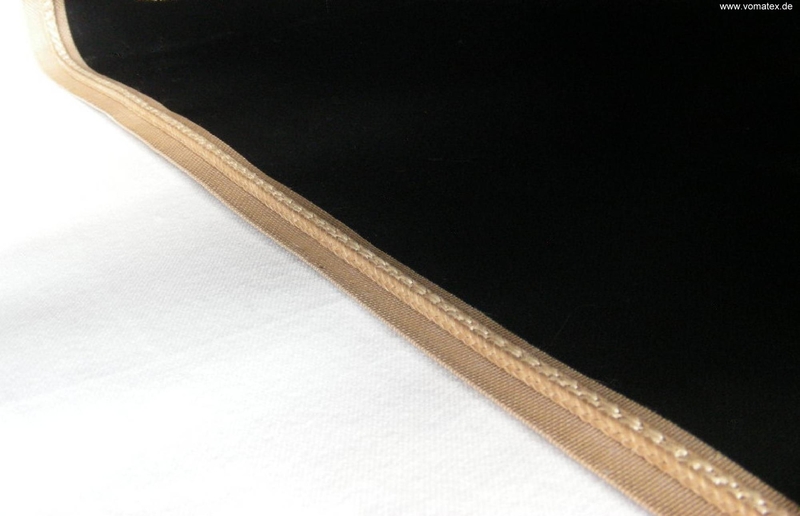 Transport belts with seam usually show a bad heat transfer at the seam. Moreover a seam may cause different tensions inside the belt structure and thus can reduce its lifetime. All these problems are avoided by using endless woven belts. Also manufactured in antistatic black. Available in many different types. Please choose the material and connection type below! with almost invisible grinded seam. Please submit the required dimensions! you may prefer the more expensive Kevlar/Aramid which gives the product a better bending behaviour. 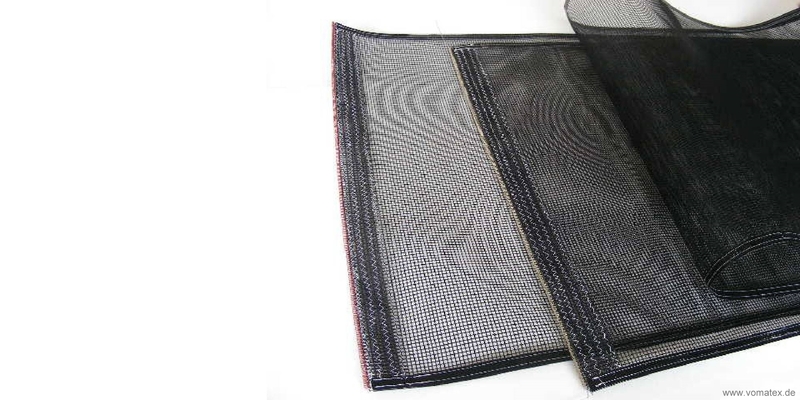 Black PTFE coated fabrics are antistatic due to carbon pigments. 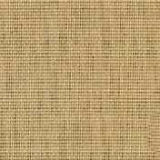 the brown PTFE coated fabrics will be perfect and a little less expensive than black. Most of our welded belts are supplied with a 300 mm diagonal overlap connection. Grinding the overlap connection gives the seam a smooth surface and makes it almost invisible. A diagonal connection is dispensing the stress caused to the belt when the stiff seam goes around the rollers. 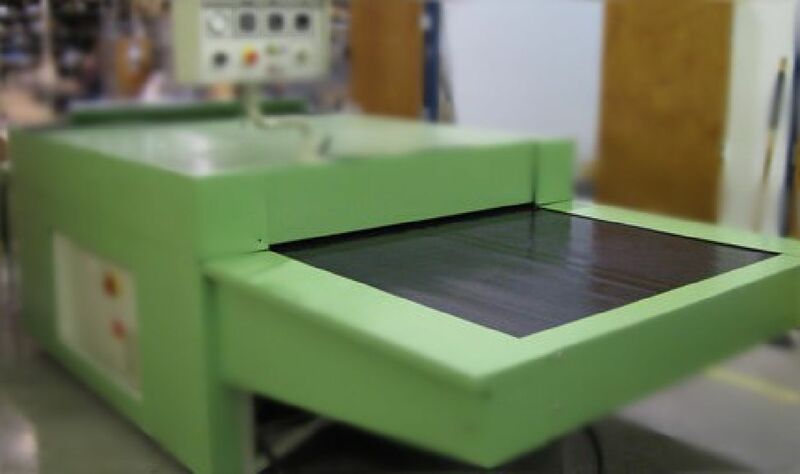 Open transport belts of PTFE coated fabrics are exactly precutted pieces for self welding on the fusing machine. They can be prepared for overlap or edge-to-edge connection in different angles (details above). 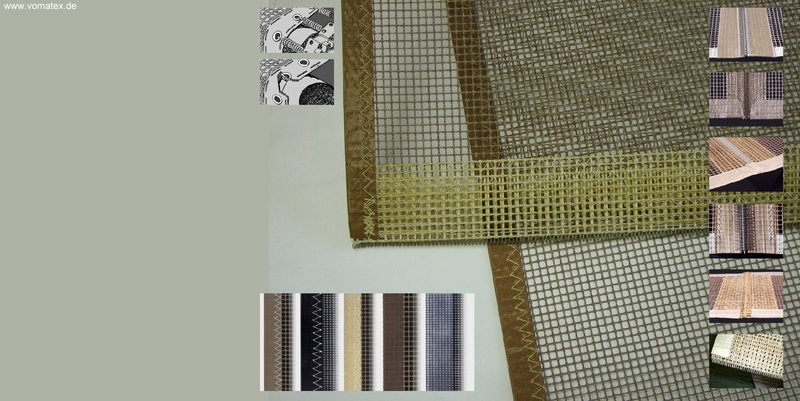 You may choose from different types of PTFE coated glass fabrics and PTFE coated Kevlar fabrics. 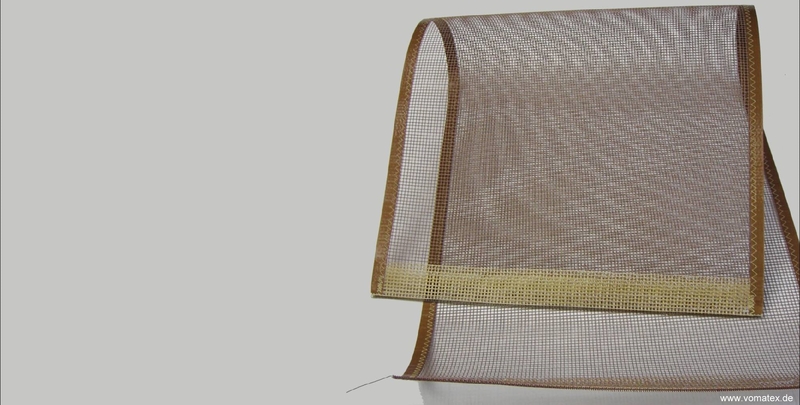 Attach the exactly cutted PTFE coated fabric to the correct position at the fusing machine and clean the edges carefully. Do make sure there is no silicone residue. 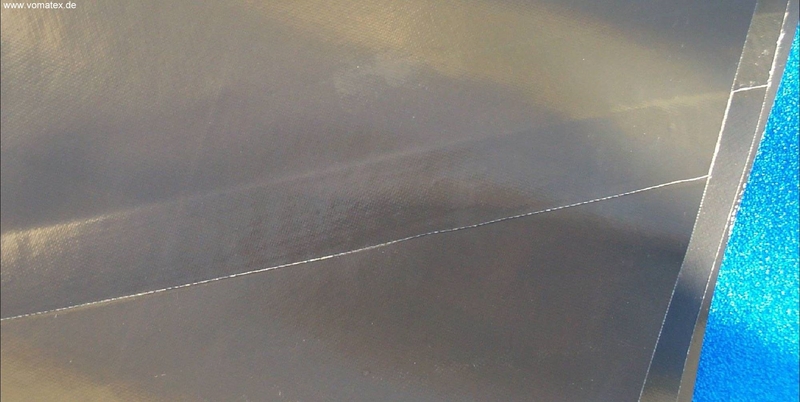 Put the welding film straight between the two edges which shall be connected. Eventually use magnets, weights or some drops of water to fix the welding film. Then place a welding iron (available from VOMATEX) or an industrial iron at about 360°C on the middle of the seam and press shortly. Lift the iron and press it more left and right until the edges will not slip any more. Move the iron with sufficient pressure from the middle to the left and right until the welding film is completely melted and the seam is totally closed. Take care that the belt does not move or slip. Before using the machine again, let the seam get cool. 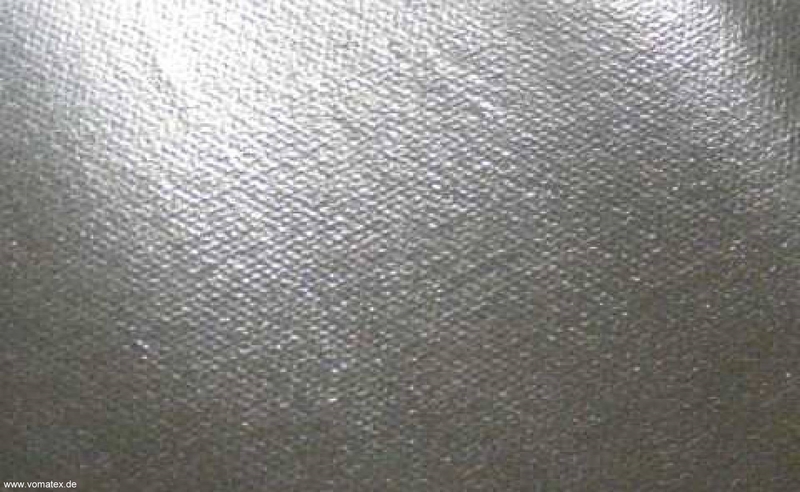 The welding film needs min. 206° Celsius but take care not to use higher temperatures than 400° Celsius because this would destroy the PTFE. The welding can be done more quickly and securely with a hot lower buck or a welding bar which is also available from VOMATEX. 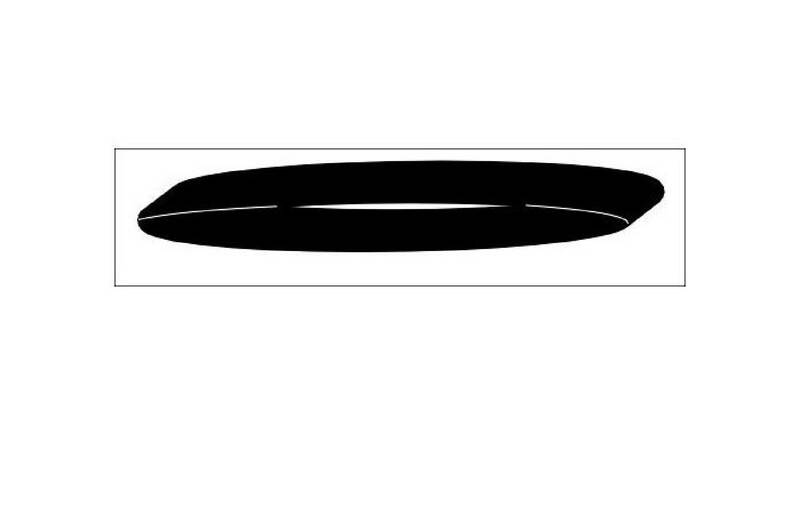 You may download the instructions for the installation of PTFE transport belts here. For making complete transport belts from PTFE coated fabrics please use our welding film which is available from stock in 25 mm and 50 mm width and a welding iron which is able to hold a temperature of about 340°C to 360 °C. 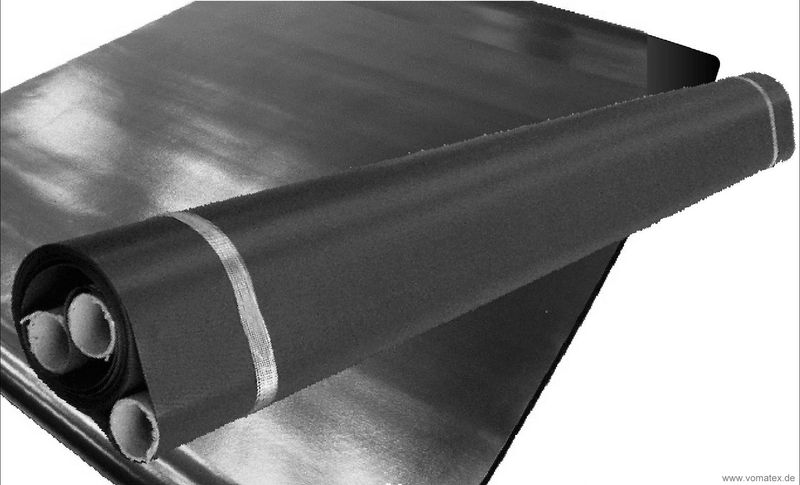 The VOMATEX welding iron was built especially for welding endless transport belts. 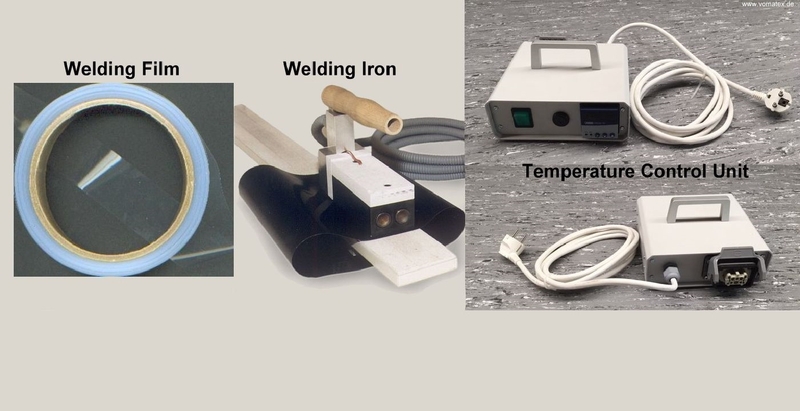 If you require a welding set with iron, temperature control unit, welding bar and iron rest please do not hesitate to send us your inquiry. Temperature control stripes are chemical reacting paper thermometers. Reaching the printed temperature, the indicator changes its colour from light grey to black. Because the change is irreversible the stripes can be used as a proof for the reached temperature. The paper is very thin to allow a quick heating. Thus the response time of the indicator is less than 1 sec. which is especially important at short pressing times. The accuracy of the measurement is at +/- 1% of the printed values. The use of temperature control paper stripes is very easy. For example during fusing you put the stripes between fabric and interlining with the indicator side of the stripes to the fabric. Now fuse as you are used to do. After opening the press you slightly tear the fabric and the interlining apart in order to pull the stripe out. You now can read the maximum temperature from the coloured indicators. It is important to protect the stripes against moisture and dirt to get exact results. For this reason we recommend to leave the stripes in the plastic bags in which they are delivered. If they are kept cool and dry they can be stored for nearly unlimited time.